Years before she published her internationally celebrated first novel, Anne of Green Gables, L.M. Montgomery (1874–1942) started contributing short works to periodicals across North America. While these works consisted primarily of poems and short stories, she also experimented with a wider range of forms, particularly during the early years of her career, at which point she tested out several authorial identities before settling on the professional moniker "L.M. Montgomery." 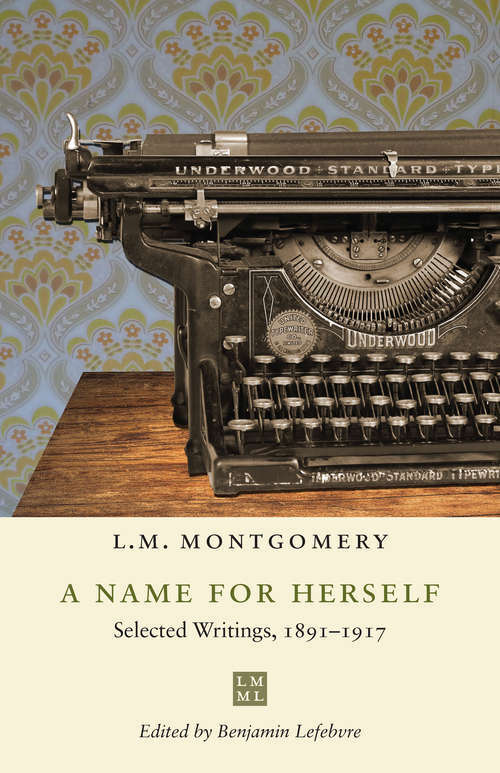 A Name for Herself: Selected Writings, 1891–1917 is the first in a series of volumes collecting Montgomery’s extensive contributions to periodicals. Leading Montgomery scholar Benjamin Lefebvre discusses these so-called miscellaneous pieces in relation to the works of English-speaking women writers who preceded her and the strategies they used to succeed, including the decision to publish under gender-neutral signatures. Among the highlights of the volume are Montgomery’s contributions to student periodicals, a weekly newspaper column entitled "Around the Table," a long-lost story narrated first by a woman trapped in an unhappy marriage and then by the man she wishes she had married instead, and a new edition of her 1917 celebrity memoir, "The Alpine Path." Drawing fascinating links to Montgomery’s life writing, career, and fiction, this volume will offer scholars and readers alike an intriguing new look at the work of Canada’s most enduringly popular author.